Need a Tree Stump Removed in Sydney? Shane’s Trees first began tree removal and stump grinding in Sydney over 35 years ago and have gone from strength to strength since then. Our team of fully qualified Arborist’s have all the tools and equipment to handle any size tree stump removal and as a company we have all the insurances & qualifications to give you peace of mind. Our prices are some of the most competitive in the industry and our customer service and attention to detail is second to none. Leave your details in the online form & we will get back to you minutes with a stump removal quote. After cutting down a tree there is always a large tree stump that is very difficult to remove and this is most efficiently achieved using a stump grinder. Even using the stump grinding machine it is still a laborious task, taking many hours and sometimes all day in difficult access areas. for those areas with easy access and small size trees this can be done 30-60 mins with an experienced operator. 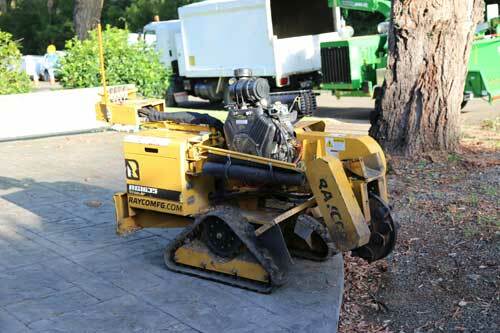 A stump grinding machine is a piece of home or business power equipment, designed to aid the removal of tree stumps. The machine usually has a sharp cutting wheel that spins at high speed and allows the user systematically grind away at a tree stump until it has been disassembled. The action of the spinning disk will turn the timber it comes into contact with into wood chips, that are easily cleaned up using hand tools. These commonly used machines come in all shapes and sizes, with some being small enough to fit on a small box trailer and others needing to be towed by heavy vehicles. These machines are very commonly used throughout the arbor industry as tree stumps are usually the result of a large tree being removed from a property. A property owner may want to remove the stump to create more space, to make way for building developments or just for aesthetic reasons. TREE STUMP REMOVAL QUOTES IN SYDNEY! A regular stump grinder consists of a cutting wheel with re-enforced carbide teeth. The operator has control over cutter wheel usually by hydraulic controls located around the handles on larger machines or simply by hand movements on smaller more manageable machines. For hand operated machines the is a pivoting or swivel mechanism that allows the operator to move the machine up to 180 degrees in a left to right motion and also to move the machine up and down on the vertical axis. On the bigger devices the setup is fairly similar except the pivots are controlled by hydraulic pistons.